NETWORK FINALS: 9JKL gained 0.1 in final numbers. CABLE HIGHLIGHTS: USA’s WWE telecast took Monday cable, although its 1.21/1.15/1.06 was far below last week’s 1.80/1.70/1.63. VH1’s LOVE & HIP-HOP was at 0.05/0.98, compared to last week’s 0.96/0.93. Discovery’s STREET OUTLAWS was at 0.80/0.57, compared to last week’s 0.80/0,53. On MTV, TEEN MOM slipped 0.03 to 0.69, and SIESTA KEY was up 0.03 to 0.37. On Bravo, VANDERPUMP RULES ticked down to 0.63, and SUMMER HOUSE was up 0.03 to 0.29. ESPN’s COLLEGE BASKETBALL doubleheader was at 0.49/0.41. 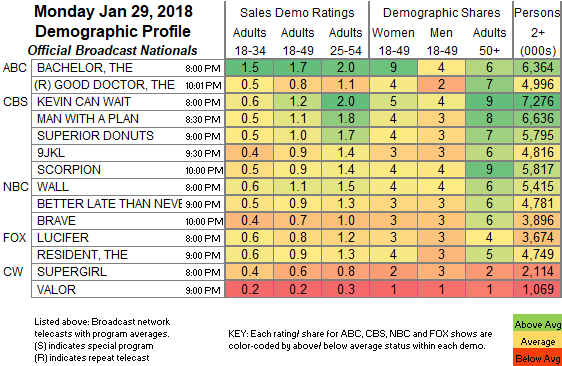 It’s hard to compare TNT’s THE ALIENIST with last week, where it aired at least 4 times on TNT and TBS, but strictly Monday TNT vs Monday TNT, it was down 0.05 to 0.46. In cable news, Fox News’s HANNITY won the night at 0.46/0.78/4.4M, over MSNBC’s RACHEL MADDOW SHOW at 0.42/0.62/3.2M and CNN’s CNN TONIGHT at 0.25/0.35/1.1M. On Food Network, KIDS BAKING CHAMPIONSHIP fell 0.06 to 0.38, and RIDICULOUS CAKES ticked down to 0.26. 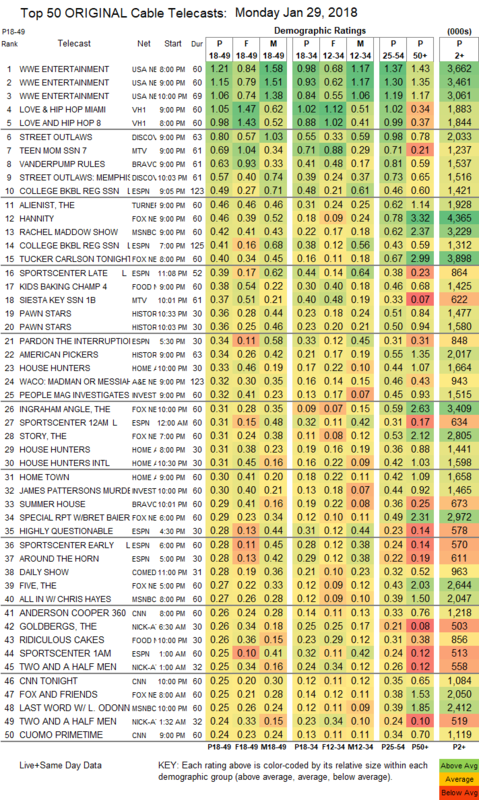 On History, PAWN STARS was at 0.36/0.36, compared with last week’s 0.33, and AMERICAN PICKERS was down 0.04 to 0.34. On HGTV, HOUSE HUNTERS was at 0.33/0.31 compared to last week’s 0.35/0.26, HOUSE HUNTERS INTL lost 0.02 to 0.31, and HOME TOWN ticked down to 0.30. A&E’s WACO: MADMEN OR MESSIAH was at 0.32/0.28. On ID, PEOPLE MAGAZINE INVESTIGATES ticked up to 0.32, and MURDER IS FOREVER was down 0.02 to 0.30. Paramount’s COPS was up 0.04 to 0.18.